Whistler is a world-famous destination, and it has as much jaw-droppingly scenic wilderness as it does luxury outlets to earn that title. For example, if your dream vacation involves spa treatments, private heli-ski tours and gourmet dinners, you’ll find that Whistler has what you’re looking for. At heart, though, Whistler is still just a small mountain town with an incurable passion for the outdoors. The village is rightfully proud of its fun-loving, free-ranging spirit, and the majority of its visitors and residents are people who are drawn simply by what the surroundings have to offer: the lakes, the rivers, the lush forests and the high mountains. The Whistler of today is a place that has something for everyone — and something for travellers on almost any budget. When the first lodge was opened on Whistler’s Alta Lake in 1914, its owners couldn’t have picked a prettier spot. Whistler’s natural landscapes are spectacular, and they’re open for all to enjoy. Lost Lake Park, just a short walk from Whistler Village, is a local favourite, with a network of picturesque trails that are ideal for cross-country skiing in the winter (there is a fee for skiing in winter, but enthusiasts can hit the cross-country trails along the valley trail for free) and walking or trail running in the warmer months. The lake is also a great swimming hole in the dog days of summer — and, with a dog-friendly beach, even Snoopy is welcome to come along. The town also boasts some great cycling trails, from the gentle Valley Trail to technical single-track for mountain bikers. 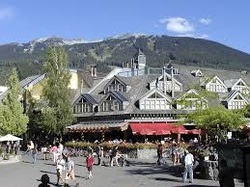 Whistler’s car-free village itself has always been one of the town’s main attractions — so much so that other resorts have tried to emulate it (with varying degrees of success). With its network of pedestrian-only pathways, squares and plazas, it’s always a lively place and a fantastic place for people watching. There’s no better place to wander in the evening and soak in the atmosphere of one of Canada’s most diverse towns. You may be tempted, though, by the patios, the galleries and the local boutiques. If you visit during one of the Whistler’s many cultural festivals, you’ll find even more to stimulate the senses. The village bustles from dawn to dusk, and things really come alive after dark. Whistler has its share of fanatical skiers and snowboarders angling for air and edging down super-steep couloirs. It’s not all extreme up on the mountains, though, and there’s a wide range of excellent terrain that the whole family can enjoy. Kids under six can ski for free at Whistler Blackcomb, so you can enjoy easy cruisers like Green Line and Pony Trail with your little ones. In the summer months, tykes under 12 can golf for free at the village-based courses. Combine that with a picnic in the park or a bag lunch at the Rendezvous hut on top of Blackcomb, and you’ve got an affordable and fun-filled day for the family.